What would the ‘Pink City’ be without the Place du Capitole? If there is one building in Toulouse not to miss and worth visiting, this is it. The Capitole complex hosts the City Hall and the National Theatre of Toulouse. This is, in fact, the heart of the historic city. Since its foundation in 1190, the Capitole of Toulouse is the main part of the town and has changed the face of Toulouse old town. Even though nothing remains nowadays of the original building, the current complex reflects the successive transformations of the space: the oldest element is the Keep (the ‘donjon’ also known as the ‘Archive Tower’) built in the sixteenth century. Thanks to the Capitole and the Capitouls, the complex helps to make Toulouse one of the most beautiful cities of France. In Roman times, the life of the city was organised around the square of the Carmes, on the site of the ancient forum. In 1190, the “capitouls”, equivalent to councillors, decided to buy a collection of houses which they turned into a common house where they could meet and exercise their power. Thus was born the Capitole. The end of the 11th century marked the departure of Count Raymond IV to the Crusades and several succession wars followed. In order to govern Toulouse during the Crusades, the Count’s son and grandson shared power with the Capitouls who had the responsibility of regulating the exchange and making sure laws were implemented. The first acts of the new masters of the city dated back to 1152. In 1189, the Capitouls took the opportunity, after a ten year war between Raymond V and the Kings of England and Aragon, to wrest their autonomy. Even though the citizens were divided on the subject, the Capitouls finally obtained the submission of the Count of Toulouse. One year later, the construction of the future Capitole began. This was the beginning of a 600 year reign. The name “Capitole” referred not only to the Capitol of Roma, but also to the latin word ‘capitulum’ which was the chapter of the governing magistrates since 1190. Indeed, the name Capitouls derives from “Senhors del Capitol” in Occitan. Buying and building at random during three centuries, the Capitouls did not yet have a common house The construction of the municipal palace lasted almost three hundred years. Several buildings, such as the Charlemagne Tower, the Tour de la vis, and the Arsenal no longer exist today. Between 1602 and 1607, some houses situated around the site were destroyed in order to enlarge the palace. Pierre Souffron had two galleries built surrounding the Henri IV courtyard. It is in this courtyard that the duke Henri II de Montmorency was beheaded for plotting against Cardinal Richelieu. The oldest part of the Capitole remaining today is the “Donjon” or Archive Tower. It was built between 1725 and 1730 to protect the Capitouls and their archives against the Holy Emperor Charles V’s troops. The first facade was built in two stages: during the 16th century and then by Guillaume Camas between 1750 and 1760. Occupying the whole eastern side of the eponymous square, the Capitole was the seat of Toulouse’s city government from the 12th century until the French Revolution. This masterpiece unfolds its majestic facade of brick and stone on the not-to-be missed Place du Capitole. Enlarged, converted and embellished over time, texts inscribed on its walls tell of the great moments of Toulouse History. The Capitole has been listed as a historical monument since 1840. From an architectural point of view, this is a wonderfully typical illustration of Neo Classical style which resembles the City-Hall of Nancy in Lorraine. Both buildings consist of a long, rectangular three-storey façade bordering a large square (Place du Capitole in Toulouse and Place Stanislas in Nancy). Notice the brick walls and their 29 arches, a sign of a true command of aesthetical research. Even if the Capitole now hosts the eponymous theatre and the town hall, it is still a tourist monument. In this historic building, the national orchestra of Toulouse and the opera offer world renowned programs throughout the year. The architect and painter Guillaume Cammas was responsible for the renovation of the façade in 1727 and the project was adopted in 1739. The works commenced in 1750 and were finalised in 1760. It is Cammas who gave to the Capitole façade the current Neoclassical style with the famous pink bricks (although the frontage was previously hidden under white paint). Its 120 metre long façade is made of limestone and pink bricks with eight pink marble columns (from the village of Caunes Mivernois). Each of these columns represents one of the former eight districts of Toulouse (called Capitoulats) and also the Capitouls who governed the city for 600 years. The aim of this façade was to hide the heterogeneous buildings that the Capitouls had not succeeded in blending together. The new facade allowed an opera to be inserted on the right side in 1818. The Capitole comprises two floors and 41 windows with wrought-iron balconies. Each balcony was embellished by Bernard Ortet with the Capitouls crests under the construction of the frontage. The portal is a work of Nicolas Bachelier. On the triangular pediment above the columns, the seal of the French Republic was engraved in 1871 and since 1759 the word ‘Capitolium’ in golden letters, has been inscribed in honour of the city’s Roman past. The faces of Clémence Isaure et Athéna, designed by Louis Parant (Professor at the Beaux-arts school of Toulouse), complete the pediment. The grand portal of the Capitole opens onto the Henri IV courtyard. A marble statue of the French king sculpted by Thomas Heurtematte in 1607 sits above the portal. It is the only statue of Henri IV contemporary to his reign. Between the 16th and the 17th centuries, the Capitouls decided to create a courtyard surrounded by two galleries designed by Pierre Souffron. At that time, the Capitouls wished to build a gallery to display their coats of arms and portraits in an attempt to enhance their prestige. But the Toulouse Parliament vetoed this project. They therefore asked Henri IV for the money to complete the construction and in exchange they placed a statue of the king of France in the courtyard. On the ground, a slab commemorates the beheading in 1632 of Duke Henri II de Montmorency, godchild of Henri IV, guilty of a rebellion against Richelieu. Behind the new façade and up to Rue Porte-Neuve, the complex once appeared like an improbable labyrinth of eclectic architectural styles from medieval to Renaissance. With the construction of Rue Alsace-Lorraine, the municipality took the opportunity to get rid of all the buildings at the rear of the new façade (1873-1886) with the notable exception of the Henri IV courtyard, the theatre and the Donjon. A square was created between this new Capitole and Rue d’Alsace-Lorraine. The newly built edifices replicated the Cammas style of bricks and stones. The oldest remaining building in Toulouse is the Donjon (the ‘Keep’ or ‘Archive Tower’) at the rear of the Capitole which opens onto the Place Charles de Gaulle. It was built by Pierre de Naves and Laurent Clary between 1525 and 1530. The aim was to protect the Capitouls and their archives (until 1946) and also gunpowder against a possible invasion by Charles V of Spain. Neglected over time, the Donjon was saved by Viollet-le-Duc who restored it between 1873 and 1887. The architect added a belfry which did not previously exist. Since 1946, the Donjon has housed the Tourist Office of Toulouse. To visit the galleries inside the Capitole, you have to take the Great Staircase (Escalier d’Honneur) rebuilt by Rivals in 1674. A painting by Laurens, which represents the first florals games in 1324 in Toulouse, decorates one of the rooms. This painting represents the very first session of l’Académie des Jeux floraux (“Academy of the Floral Games”) which is the most ancient literary institution in the western world. It was founded in 1324 by seven troubadours with the aim of encouraging poetry. This is where all the important decisions for the city of Toulouse were taken. The room is decorated with paintings by Paul Gervais, Roucolle and Debat-Ponsan. Notice the busts of Raymond IV and of some Visigoths kings. A pink marble slab lists all the mayors of the city since 1790. All the paintings represent various monuments of Toulouse and agricultural scenes. This room and the decorations were completed in 1935. In this room, you can discover love at any age through the beautiful paintings by Paul Gervais. The painter has portrayed the allegory of love in three paintings which symbolise love at the age of 20, 40 and 60 and Cythera Island, the country of lovers. In early times, this room was the wedding hall of Toulouse. The Henri Martin room is decorated with ten paintings by Henri Martin. Four of them represent Toulouse through the four seasons. The room is also decorated with busts of some celebrities from Toulouse such as Nicolas Bachelier, Pierre de Fermat and Jacques Cujas. However, the two most famous paintings in the Henri Martin room are “Les rêveurs” and “Les promeneurs”. In the first one, you can see Jean Jaurès with his hands on his back. The scene take place on Garonne’s left bank. And on the right bank you can see the Daurade Basilica. From left to right are represented Gilbert and René Martin, Henri Martin’s sons, Jean-Paul Laurens and Henri Martin himself. This room was previously called “Salle des pas Perdus”. The splendid Salle des Illustres, with its richly carved and decorated busts of famous historical figures, is the place where weddings in Toulouse are currently celebrated. Since 1674, the new facade has hosted the Salle des Illustres. The original idea was to celebrate the people who have contributed to the history of Toulouse – and obviously the Capitouls – in a prestigious room. The first room was built in 1674 and the present room dates from 1892. The room measures 62 metres long and 9 metres high. Sculptures and paintings and all the decorations are made by Toulouse artists such as Jean-Paul Laurens, Benjamin Constant, Jean-André Rixens, Paul Gervais and Paul Pujol. The busts represent famous people from Toulouse: Theodoric, Caffarelli, Rivals, Pinel, Riquet, Raymond IV, Bachelier, Cujas, Ferma. This room has been listed as an historical monument since 1994. At the rear, a famous fresco by Laurens represents the inhabitants of Toulouse defending their city in 1218 against the army of Simon de Montfort. The ceiling is dedicated to the woman who killed Simon de Montfort with a rock and through her, the bravery of the inhabitants of Toulouse. In the sky, we can read “Montfort est mort viva Tolosa” in Occitan (“Montfort is dead, long live Toulouse”). Another fresco by Benjamin Constant represents the entrance of Pope Urbain II into Toulouse in 1096 which was attended by Raymond IV. Paul Pujol based his inspiration for the Salle des Illustres from the Farnese gallery in Rome. Once the visit to the Capitole is done, take a stroll across the beautiful Capitole Square and gaze at the large bronze Occitan cross formed by the cobblestones. 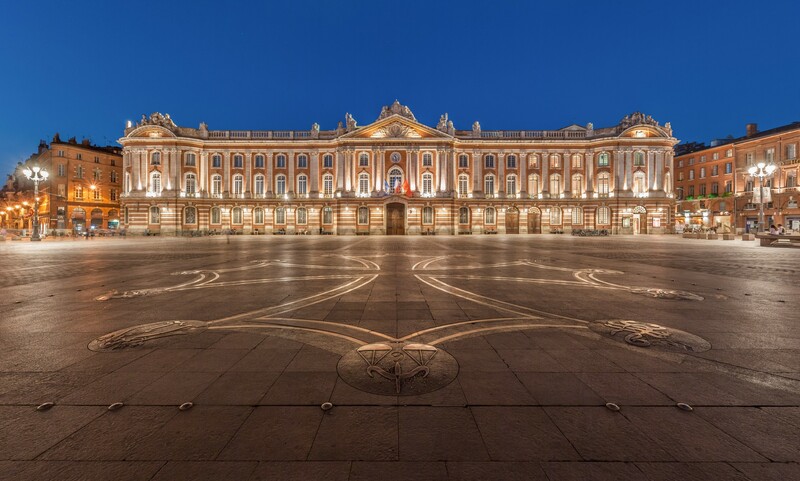 The Place du Capitole is the symbol of Toulouse’s independence. The project of the square began in 1676 by order of the Capitouls, but construction only started in 1750 and was not completed until the 19th century. It took many years to expel the occupants of the houses which once stood on the site of the square. The Occitan cross paving at the centre of the square was designed by Raymond Moretti in 1995. The branches are said to represent the signs of the zodiac and refer to the seal of the Counts of Toulouse. Well-known for its shows and concerts, not to mention numerous historical events, the square is the main meeting point for locals and visitors alike. Here you can enjoy the many events organised by the city hall: markets, cultural exhibitions, sporting events, concerts and shows thanks to the 12,000 square metres of pedestrian access provided by the square. Place du Capitole has been the stage for many historical celebrities such as Napoleon Bonaparte, Antoine de Saint Exupéry and General de Gaulle. In all, this is definitely one of those feel-good places where there is always something going on both day and night.